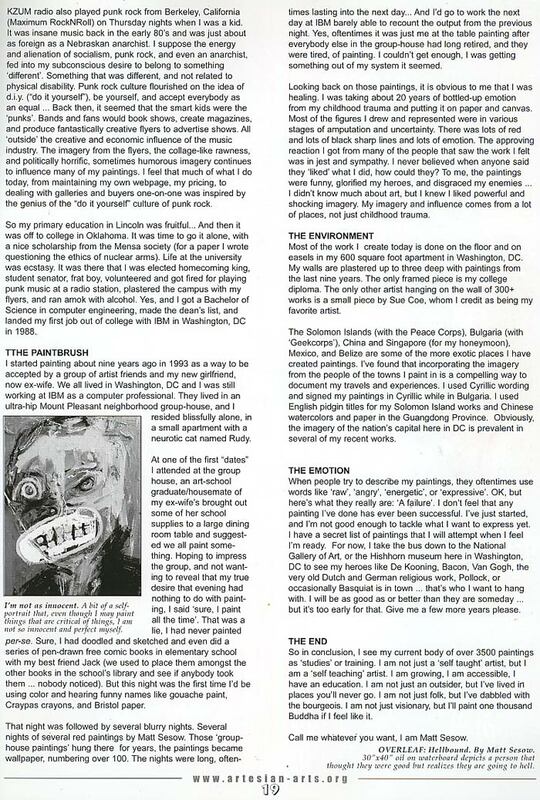 "Matt Sesows Artist Statement (2002)"
The first thing I remember was the feeling of knowing I had done something monumental, maybe even miraculous. It was as if I had watched everything unfold, made a calculated decision to bring me to this moment. But it was the look on my parents faces, their red eyes, the forced smiles, the impending truth about to be revealed to me that was the beginning of this strange journey... I was an eight-year-old boy lying in a hospital bed in Lincoln, Nebraska, I was a boy that had just survived being hit by a landing airplane. From my viewpoint, everything was fine, I had survived the planes propeller striking the arm that fed blood to my dominant left hand. I had survived being drug over 100 yards down a grassy runway in front of my playmates and siblings whom had come together that summer evening in 1974 for a friendly game of ball-tossing called SPUD. I had survived the stillness on the runway as neighbors removed my shoes and used its laces to apply a tourniquet as I bled motionless. Yes, everything seemed just as it should as I lay in that hospital bed. Although I felt a bit groggy from the six-hour operation to reattach the arm, I figured Id soon be back out on the cool grass on warm summer evenings throwing balls and running from propellers. But wait. I followed the eyes of my parents and noticed they were no longer looking at my face, but instead at my very sore arm draped in a white yellow-stained sheet. Soon a doctor came in and removed that sheet. It was as if I was looking at somebody elses body when my eyes joined those of my bedside visitors. You see, the arm of mine that had so faithfully guided blood to my left hand had just suffered a bit of trauma... we had been separated, briefly, on that grassy runway. And despite the best efforts of a terrific team of doctors, some, whom had performed similar procedures in the Vietnam War, were unable to clear and reconnect a perfect path from my heart to the left hand. My left hand was now a purple-blackish wrinkled cold appendage. I remember being able to move the fingers ever so slightly. The next thing the doctor said was something to the effect, Matt we need to remove your hand.... my response, without hesitation, was yes of course, that is fine with me. Everything was going perfectly as planned. And so my fantastic journey begins. Growing up in Lincoln, Nebraska, I was lucky to live in a college town, damn lucky. I had been exposed to the likes of Noam Chomsky, Raw Magazine (Art Spiegelman), college radio, and since I looked old, I could get into the bars (passing as 18) to see live music. It goes without saying that I was especially lucky to be raised by ultra-supportive parents; however, it was the influences I picked up from feeling a connection to the underground political and musical passion of the early 80s that is my bridge from personal experience to art. 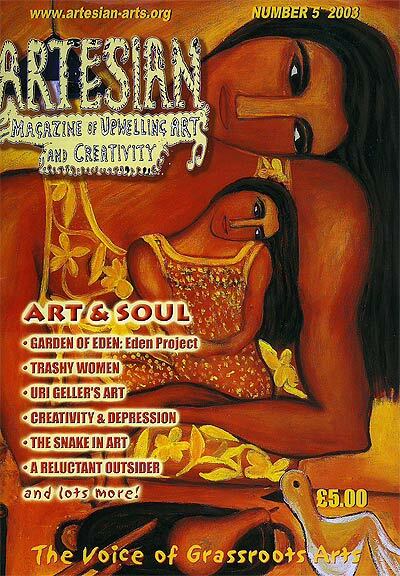 "Raw Magazine", a New York City art-school-inspired publication published two to four times a year was the first and greatest influence on my appreciation for meaningful art. I used to pick it up when I was in junior high school (1981) at a record store near the University of Nebraska campus. From that I was introduced to Charles Burns, Sue Coe, Mark Beyer, and Gary Panter. 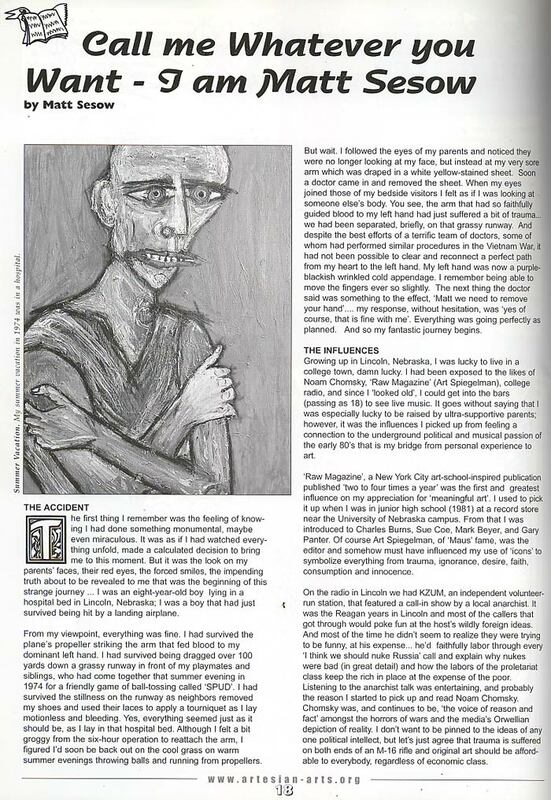 Of course Art Spiegelman, of Maus fame, was the editor and somehow must have influenced my use of icons to symbolize everything from trauma, ignorance, desire, faith, consumption and innocence. On the radio in Lincoln we had KZUM, an independent volunteer-run station, that featured a call-in show by a local anarchist. It was the Reagan years in Lincoln and most of the callers that got through would poke fun at the hosts wildly foreign ideas. And most of the time he didnt seem to realize they were trying to be funny, at his expense... hed faithfully labor through every I think we should nuke Russia call and explain why nukes were bad (in great detail) and how the labors of the proletariat class keep the rich in place at the expense of the poor. Listening to the anarchist talk was entertaining, and probably the reason I started to pick up and read Noam Chomsky. Chomsky was, and continues to be, the voice of reason and fact amongst the horrors of wars and the medias Orwellian depiction of reality. I dont want to be pinned to the ideas of any one political intellect, but lets just agree that trauma is suffered on both ends of an M-16 rifle and original art should be affordable to everybody, regardless of economic class. KZUM radio also played punk rock from Berkley, California (Maximum RockNRoll) on Thursday nights when I was a kid. It was insane music back in the early 80s and was just about as foreign as a Nebraskan anarchist. I suppose the energy and alienation of socialism, punk rock, and even an anarchist, fed into my subconscious desire to belong to something different. Something that was different, and not related to physical disability. Punk rock culture flourished on the idea of d.i.y. ("do it yourself"), be yourself, and accept everybody as an equal... Back then, it seemed that the smart kids were the punks. Bands and fans would book shows, create magazines, and produce fantastically creative flyers to advertise shows. All outside the creative and economic influence of the music industry. The imagery from the flyers , the collage-like rawness, and politically horrific, sometimes humorous imagery continues to influence many of my paintings. I feel that much of what I do today, from maintaining my own webpage, my pricing, to dealing with galleries and buyers one-on-one was inspired from the genius of the "do it yourself" culture of punk rock. So my primary education in Lincoln was fruitful... And then it was off to college in Oklahoma. It was time to go it alone, with a nice scholarship from the Mensa society (for a paper I wrote questioning the ethics of nuclear arms). Life at the university was ecstasy. It was there that I was elected homecoming king, student senator, frat boy, volunteered at and got fired for playing punk music at a radio station, plastered the campus with my flyers, and ran amok with alcohol. Yes, and I got a Bachelor of Science in computer engineering, made the deans list, and landed my first job out of college with IBM in Washington, DC in 1988. I started painting about nine years ago in 1993 as a way to be accepted by a group of artist friends and my new girlfriend, now ex-wife. We all lived in Washington, DC and I was still working at IBM as a computer professional. They lived in an ultra-hip Mount Pleasant neighborhood group-house, and I resided blissfully alone, in a small apartment with a neurotic cat named Rudy. At one of the first "dates" I attended at the group house, an art-school graduate/housemate of my ex-wifes brought out some of her school supplies to a large dining room table and suggested we all paint something. Hoping to impress the group, and not wanting to reveal that my true desire that evening had nothing to do with painting, I said sure, I paint all the time. That was a lie, I had never painted per-se. Sure, I had doodled and sketched and even did a series of pen-drawn free comic books in elementary school with my best friend Jack (we used to place them amongst the other books in the schools library and see if anybody took them ... nobody noticed). But this night was the first time Id be using color and hearing funny names like gouache paint, Craypas crayons, and Bristol paper. That night was followed by several blurry nights. 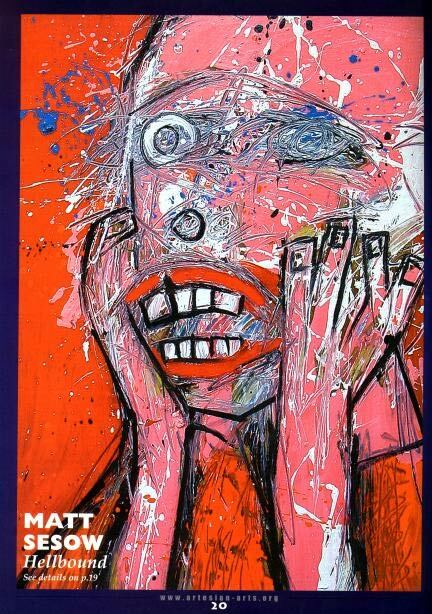 Several nights of several red paintings by Matt Sesow. Those group-house paintings hung there for years, the paintings became wallpaper, numbering over 100. The nights were long, oftentimes lasting into the next day... And Id go to work the next day at IBM barely able to recount the output from the previous night. Yes, oftentimes it was just me at the table painting after everybody else in the group-house had long retired, and they were tired, of painting. I couldnt get enough, I was getting something out of my system it seemed. Looking back on those paintings, it is obvious to me that I was healing. I was taking about 20 years of bottled-up emotion from my childhood trauma and putting it on paper and canvas. Most of the figures I drew and represented were in various stages of amputation and uncertainty. There was lots of red and lots of black sharp lines and lots of emotion. The approving reaction I got from many of the people that saw the work I felt was in jest and sympathy. I never believed when anyone said they liked what I did, how could they? To me, the paintings were funny, glorified my heroes, and disgraced my enemies ... I didnt know much about art, but I knew I liked powerful and shocking imagery. My imagery and influence comes from a lot of places, not just childhood trauma. Most of the work I create today is done on the floor and on easels from my 600 square foot apartment in Washington, DC. My walls are plastered up to three deep with paintings from the last nine years. The only framed piece is my college diploma. The only other artist hanging on the wall of 300+ works is a small piece by Sue Coe, whom I credit as being my favorite artist. The Solomon Islands (with the Peace Corps), Bulgaria (with Geekcorps), China and Singapore (for my honeymoon), Mexico, and Belize are some of the more exotic places I have created paintings. Ive found that incorporating the imagery from the people of the towns I paint in is a compelling way to document my travels and experiences. I used Cyrillic wording and signed my paintings in Cyrillic while in Bulgaria. I used English pidgin titles for my Solomon Island works and Chinese watercolors and paper in the Guangdong Province. Obviously, the imagery of the nations capital here in DC is prevalent in several of my recent works. When people try to describe my paintings, they oftentimes use words like raw, angry, energetic, or expressive. OK, but heres what they really are: A failure. I dont feel that any painting Ive done has ever been successful. Ive just started, and Im not good enough to tackle what I want to express yet. I have a secret list of paintings that I will attempt when I feel Im ready. For now, I take the bus down to the National Gallery of Art, or the Hishhorn museum here in Washington, DC to see my heroes like DeKooning, Bacon, VanGogh, the very old Dutch and German religious work, Pollock, or occasionally Basquiat is in town... thats who I want to hang with. I will be as good as or better than they are someday.... but its too early for that. Give me a few more years please. So in conclusion, I see my current body of over 3500 paintings as studies or training. I am not just a self taught artist, but I am a self teaching artist. I am growing, I am accessible, I have an education. I am not just an outsider, but Ive lived in places youll never go. I am not just folk, but Ive dabbled with the bourgeois. I am not just visionary, but Ill paint one thousand Buddha if I feel like it. Call me whatever you want, I am Matt Sesow.